Written by Wagner Meters, published first by ProInstaller (Summer 2014 issue). Nearly 75 years ago, Swedish wood flooring company Kahrs introduced engineered wood flooring. As an alternative to hardwood floors, engineered wood flooring is comprised of a relatively thin layer of hardwood glued to a core of plywood or some type of fiberboard that’s not visible. In recent years, engineered flooring has surged in popularity, both in homes and commercial applications, for several reasons. It comes in a wide variety of colors, textures, and strip widths to suit most any taste, it is durable and cheaper substitute for solid wood floors, and it is more versatile and eco-friendly. Because engineered flooring is less prone to moisture damage, it can be installed over a variety of surfaces in many applications, including basements, kitchens, and bathrooms with light moisture. Although an engineered floor can, in many situations, be a better choice than a solid wood floor, it is not perfect. For instance, complications may occur after installation due to undesirable moisture and relative humidity (RH) levels in both the engineered product and the concrete sub-floor. In addition, despite the fact that engineered flooring can be installed in places unsuitable for solid wood, it is not meant for extreme conditions. Installers should be aware that large humidity swings, excess moisture, and lack of climate control can cause engineered floors to break down just like wood floors. The space for the engineered flooring needs to be conditioned based on the manufacturer’s guidelines. 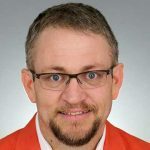 Manufacturers typically require a range between 35% and 55% ambient RH, but those guidelines can vary. Some manufacturers may have a range of 40-60% RH while others may require 30-50% RH. It’s important for installers to know if the end-user has the ability to control the climate within those ranges after installation. Otherwise, trouble can occur. For instance, if an engineered flooring manufacturer’s low RH range is 40% and the product is installed in Nevada where the average RH is about 30%, problems can occur – unless the end-user is able to control the RH. 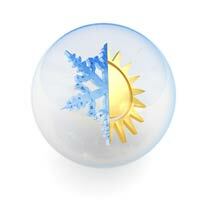 The same issue can occur in the Midwest where the humidity varies widely between winter and summer. When it’s 5° F outside, it’s difficult to maintain the RH at 40% when the furnace is running constantly. Such imbalances can lead to checking/splitting, delamination, and end-gapping. In these cases, flooring failures may not be covered under warranty. Variances in RH can occur from floor to floor or even room to room. For instance, humidity levels can rise in a building because of humidifiers, steam radiators, moisture-generating appliances such as dryers, or combustion appliances such as stoves. Cooking and showering also can increase indoor humidity. When indoor RH is low, “dry cupping” can occur in engineered flooring. The top wear layer tends to dry out much faster than the core board material, especially if the wear layer is thin. As the wear layer rapidly dries, it tends to pull away from the bottom core material. The result is a cupped floor, with the corners lifting or curling first. In addition, splits and checks can also occur when RH is low. Splits are openings that run from top to bottom, while checks are smaller openings that don’t run as deep. The stress in the boards can also cause the finish to show wrinkles or ruptures. To prevent complications because of low RH, it’s recommended that the end-user install a whole-house humidification system that turns on with the heat. Whole-house humidification systems not dependent on heat also are available for arid climates such as in the Southwest. At the minimum, small portable humidifiers can also be used. The key is to keep the RH levels constant, even if a bit high or low, to prevent cracking and checking in the boards. Although engineered wood flooring is less prone to moisture damage, it is wood after all and still requires the same MC management as any other wood product. All wood holds moisture content. As the RH rises, wood absorbs moisture from the air. And, as RH falls, wood releases moisture into the air. Wood, therefore, must be allowed to reach its equilibrium moisture content (EMC). That is, it must reach a balance between the wood’s MC and that of the ambient conditions. Also, some engineered products combine several woods, each with its own distinct MC characteristics. If installers don’t pay sufficient attention to those wood characteristics, problems may follow. Another important factor about engineered flooring is that the core and the wear layer react differently to moisture. If the two have different MC levels, they can become out of balance. The performance of the floor in these conditions depends on several factors, including MC at the time of manufacture, core construction types, and thickness of the wear layer. For instance, it’s often claimed that “the thicker the wear layer, the better the flooring”. That claim may not always be true. Moisture may affect a thicker wear layer in a manner similar to solid wood – in effect, expanding and contracting more than a thinner wear layer. If the top wear layer and the core have the same shrinking tendencies, engineered wood will move just like solid wood. If the top layer and the core shrink differently, then the panel is more moisture sensitive. This can cause more shrinking and warping. As a general rule, the core of engineered flooring is more dimensionally stable than solid wood flooring because of its multiple layers of plywood, high-density fiberboard, or hardwood. However, large humidity swings, excess moisture, and lack of climate control will cause an engineered floor to fail just like a solid wood floor. Experts in the wood flooring industry recommend measuring for MC and RH before and during installation. Relying on old-fashioned methods of feeling the wood or eyeballing the sub-floor can be risky, resulting in costly problems later. A good wood moisture meter is essential for any successful wood floor installation. Installers can easily use hand-held moisture meters to accurately and cost-effectively assess the MC of their wood. Wagner Meters offers a complete line of wood moisture meter products designed to meet almost any use, and they can measure the MC of the majority of wood flooring used today as well as subfloors and wood materials. 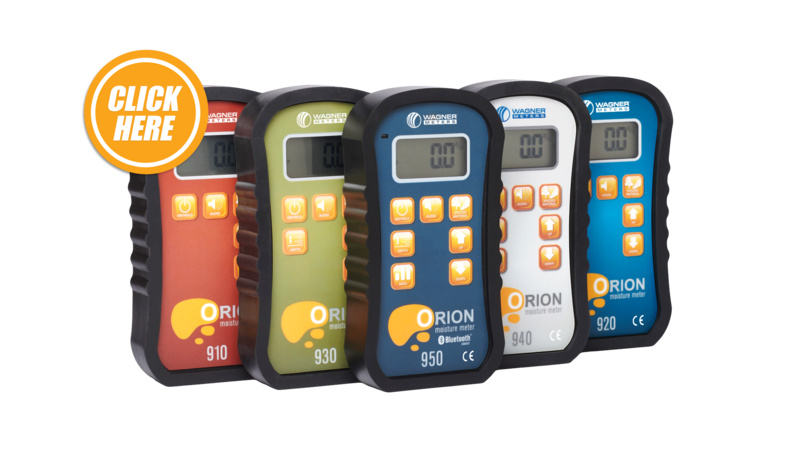 Wagner Meters’ Orion® wood moisture meters pinless technology offer fast and accurate readings of wood’s moisture content without leaving unsightly pin hole damage. It’s important to take moisture measurements at the time of delivery, before acclimation, after acclimation, and after job completion. Waiting until the floor shows defects from shrinking and cupping may be too late to file a claim since the MC at the time of delivery cannot be determined. Although engineered flooring can be installed successfully on either on-grade or above-ground concrete slabs, it’s critical to understand that moisture measurement and management are necessary for the concrete slab as well as the hardwood flooring. Like wood, concrete has independent, changeable moisture levels that vary with changes in ambient RH. Concrete absorbs water vapor as RH rises and releases water vapor into the air as RH falls. Moisture can also enter concrete from other sources, such as excessive rainfall, ground seepage, or a leaking appliance. This will upset the balance between ambient conditions and the conditions necessary to have engineered floors look and function properly. The reverse is also true. Installers, therefore, must be certain MC levels are stable in both concrete and wood before combining them. According to flooring industry standards, concrete sub-floors should be given enough time to dry to an appropriate RH level before engineered flooring is installed. In this instance, installers should use a wood moisture meter to ensure precise moisture measurement of the finished wood flooring product and an appropriate RH testing device to ensure concrete feasibility for installation. 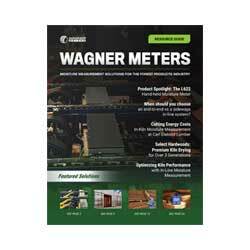 Wagner Meters has the equipment to perform both types of testing. Assessing the concrete and wood moisture levels separately reduces the potential risk of future moisture related problems that can occur when combining the two materials. Certainly, engineered flooring provides customers and installers with a number of options for an aesthetically-pleasing, long-lasting installation. However, it’s important to know the conditions where the flooring will be installed and the acceptable RH range from the manufacturer. While engineered flooring may be less susceptible to moisture, the flooring material, and the concrete slab should still be checked for moisture to avoid costly call backs and unhappy customers. we require concrete moisture measurement as well level measurement of wooden flooring. Kindly suggest suitable meters and provide your price for supply of 5 nos each. Thanks for writing, D. While I’d be happy to help, I feel that your questions and concerns would best be answered by the National Wood Flooring Association (NWFA). You can contact them here: http://woodfloors.org/. I fear an earlier comment may have been sent prematurely. Therefore, I am writing again about my situation. My engineered flooring layed over concrete is developing a “blackened” surface along the 114″ of the raw end cuts that go undered my marble 2 sided wood burning stove hearth. The installer has sealed the joint between the marble & flooring with a bead of clear silicon. The double sided wood burning stove & hearth sit within an old stone & brick wall in Ireland. The raw end cuts of the flooring along all the wall space on all both sides of the marble hearth are free of blackness except for 2″ to the right adjacent to one side of the hearth. The wood flooring was replaced after a water leak and has developed this blackness about a year after installation. The previous engineered floor that was there for 12-18 months also had not developed the blackness. What do you think is going on? I feel the area under the hearth was never dried out properly and with the subsequent silicon seal the moisture was locked in to create the blackening (which I suspect is wood rot). Please let me know your thoughts on the situation. We finally decided to change our carpet a d chose a laminate. The installer came to measure and told us they wont install florrs since the humidity leven in the subfloor is too high. We live in Ohio. What options do we have…? I really don’t want to keep the carpet. THANKS! Has there been a leak or a damp condition under the house? If so, drying of the space under the house or perhaps replacement of some of the subfloor may be in order. Typically, Installers will let the flooring acclimate to the surrounding conditions for many days, or weeks before installing. I would ask your Installer what your options are. The best conditions for wood flooring is consistency. You want the same room conditions that existed when the flooring was installed. In other words, the same temperature and humidity levels are best for your wood floor. Wood is like a sponge. If the surrounding humidity is very high, the sponge (wood) will absorb moisture. We all know what happens when a sponge absorbs moisture…it swells, just like wood. This will create all kinds of irregularities in your floor. You will also have problems if your room condition is very dry. The floor will shrink and you will have gaps between boards. I have Engineered wood flooring is made up from 3 layers. The top is 3mm Oak species and the core layer is spruce/hevea and then the backing is spruce 2mm thick. it is a 6 feet long panel. Panel/plank moisture content is 6.5% – 8.5%. My question is that how is a plank tends to bow? Bow concave or convex under 50% – 70% relative humidity? Wood floor bowing, especially long planks, and the fact that there are multiple species, all contribute to the bowing process. The direction of the bow depends on which species (side) dries more than the other side. A good way to prevent this is to equilibrate the flooring in the installation room for a least a week under the same conditions that the flooring will see once installed. I have a Legno Bastone french white oak imstalled on a second and third story on wooden trusses and plywood. Where there was is fill that runs down the grain of the wood the wood is lifting , or maybe you could call it splintering all the way down the grain. I live in Florida and my house is climate controlled 100% of the time. Please, I would appreciate your opinion. Perhaps an area of the plywood was too wet to install the flooring. It is also possible there is a leak in the area of the lifting/splintering. If this is a new floor, perhaps the installer did not acclimate the flooring before installation or check the moisture content of the plywood. Wagner makes an inspection moisture meter, called the BI2200, for examining building materials for excessive moisture. I would have the original installer have a look at the floor. Another good source is http://www.NWFA.com. We are manufacturer of eng flooring. As you said, we still need to control the moisture content of wood we use although eng wood is much more performed than solid wood vs humidity changes. 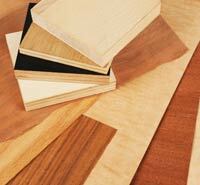 Before controlling, we need to determine the MC of flooring which is composed of different species. We use few species of layer of wood to make our own plywood. We of course will control each layer before pressing. However, we still need to find out the moisture content of finished eng wood flooring at the very last stage. Example, Face wear layer is Hickory, 1.5mm thick and Acacia\Eucalyptus\Poplar mixed plywood. What is the right # that I need to use in MMC220 then. Again, I would use the setting that makes up the bulk of the flooring. I think .57 would be a good setting. Note: Because of the multiple species that make up the flooring, the reading you get may not represent a true percent moisture content. You can still get a relative reading that is useful as a benchmark between different pieces of flooring. I think caution is in order. Because of the high humidity in Florida, especially on the gulf coast, exposed concrete will absorb moisture. I don’t know if it’s possible, perhaps a vapor barrier between the concrete and hardwood floor will solve this problem. Ask your installer. I live in SC in a 30 year old house built on a crawl space. I had engineered wood flooring installed in my dining room and kitchen approx. a year ago. The kitchen floor was installed over a particle board subfloor and has no issues…yet. The dining room was installed over an existing oak hardwood floor which has had no issues in 30 years. Recently we noticed buckling in the dining room floor and called installers back out. They removed several pieces of the new engineered flooring and discovered that the original hardwood floor was buckling at the seams. Any idea what might have caused this? Is there any ventilation below the hardwood flooring to allow high humidity water vapor to escape? With all the wet weather in the Carolinas, my guess is that the ground is very saturated and high humidity is under crawl spaces and subfloors. This is being absorbed by your flooring. The other possibility is a leak from plumbing or maybe a dishwasher etc. A moisture meter is a good tool for checking your flooring. Thanks for the question. The cracks and checks may diminish, but they will never “heal”. It sounds like the heat and low humidity have caused the floor to shrink. Possibly adding moisture to the air, and in turn to the floor, some of these issues MAY become less noticeable. Good luck.